I've been a member on here for a few weeks now and have gotten some fantastic help and advice, and I am extremely grateful for it all. I got this brush a couple of weeks ago along with another brush and I find it is absolutely superb. Really enjoyed using them both. Unbelievably soft Plissoft fibres/bristles, very large knot, and has the perfect amount of backbone for lathering soaps and also enough flop in the tips to cover a vast amount of your face in one stroke. I cannot believe just how soft the tips of this brush are. Admittedly not has tightly packed knot as the Simpson Chubby 2 synthetic (which is the other brush I got and that has an insane amount of fibres in the knot). I have been using BB for bowl lathering and it does a outstanding job. I have used this brush with Proraso soaps and also Taylors Of Old Bond Street tub cream and it is outstanding with them both, especially with the Taylors Of Old Bond Street which lathers up amazingly quickly and lots of it. The brush splays relatively easy, despite it having a perfect amount of backbone, but personally I don’t see the need to do it with any shaving brush, and instead I use a back and forth “paint brushing” motion. 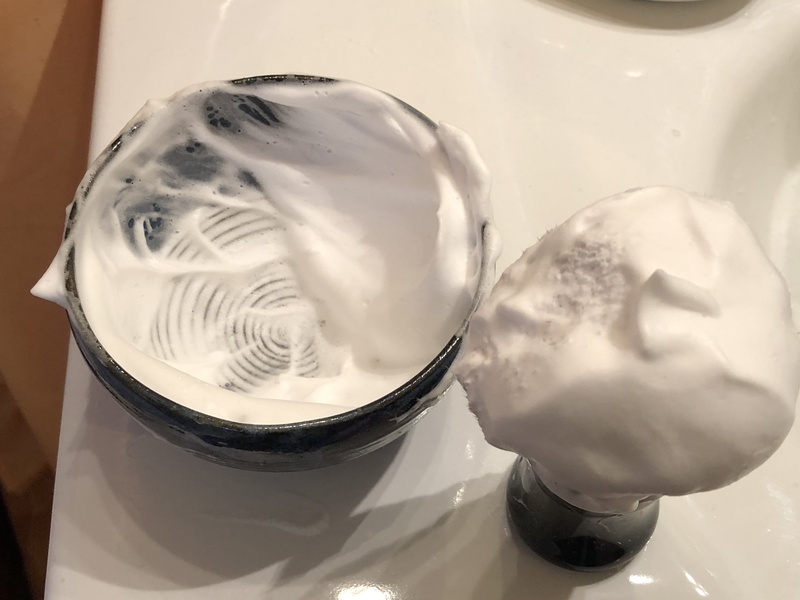 It holds tons of lather and still has a heap left in it after three passes, so what I usually do with the remainder of the soap is, I squeeze it out of the brush and rub it around my face, and leave it on, until I have washed out the lathering bowl and my brush. The brush is really comfortable in the hand, and has a perfect and comfortable to grip handle, even when wet etc. I’m so pleased I went with a synthetic brush as I can wet the brush and its ready to go (no soaking required I find) and it dries quickly and is usually dry later on in the evening when I come back home. I cannot see my Semogue 1438 Boar Hair brush getting any use now, and would probably sell this at some point, now that I have this fantastic brush and also the equally fantastic Simpson Chubby 2 synthetic. With all of the good I have wrote above about the Big Bruce, the asking price is an absolute steal, at under £20, it should be in everyone’s shaving kit. Thanks for your review - I am about 4 weeks behind you on my search for my first couple of brushes. The Big Bruce seems to be out of stock in a lot of places - where did you get yours from?? I got mine from Shave Lounge, which unfortunately is now out of stock on them to. Have to agree on the RazoRocks, great performance & superb value for money. I'm pretty new to nicer kit, only since Jan, but got a Disruptor with the Plissoft knot, and just bought the monster F-400, which loads and lathers Mitchells Wool Fat in seconds. It also works with all the other soaps and creams I have been trying too. Thanks - I'll give them a call and see when they are due back in stock - taken me this long to take the plunge so a few extra weeks won't hurt! 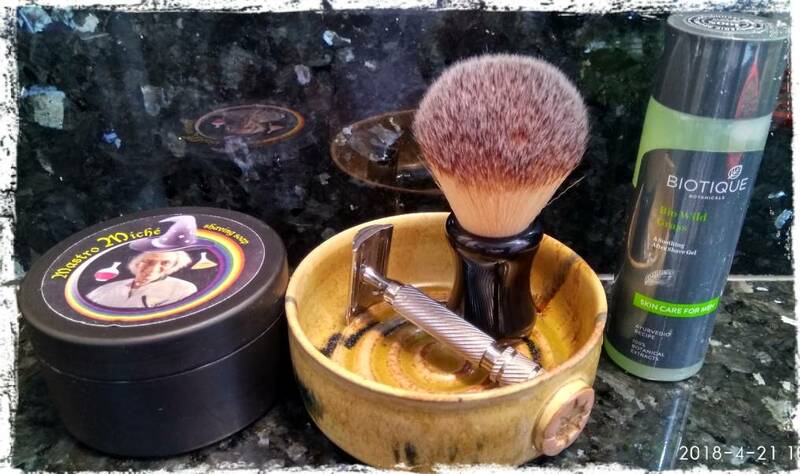 A good reveiw, although I'm not a massive fan of synthetic shaving brushes in general or anything else Synthetic for that matter I do have a couple of them one of them being the Big Bruce and I have found it to be a very good brush indeed, both in performance and ergonomics and of course drying time. You certainly get a lot of brush for your money. Good lather shots by the way P.
I do find the BB easier to hold than the Simpson Chubby 2 synthetic brush that I own, both very different brushes, for different reasons, but both that I really like. I agree, the BB is a lot of brush for a little money, exceptionally good value. I've had one for a while, great value and has become my go-to brush. I liked your review, thank you. I have a few RR synthetic brushes and I'm happy with their performance, the silver a400 type brush is my favourite. 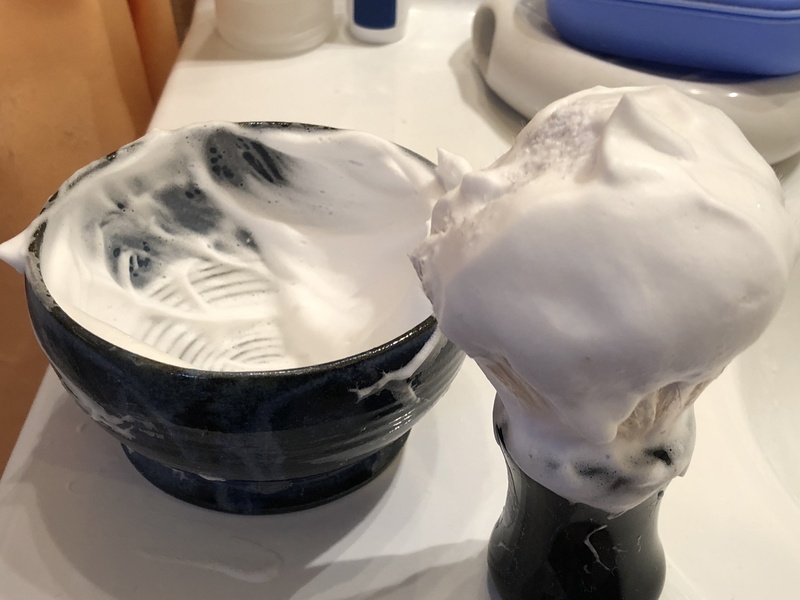 What lather bowl is that you are using? Great review. Sums up the brush nicely. How do you find it dries? The only small niggle I have had with mine with the drying time and the way that the bristles clump when drying in comparison to other brushes. I find myself spending extra time towelling it before hanging it up. How does the chubby fit in the hand? Can you comfortably give it a two finger / thumb grip on the bristles - barber style? I notice it takes a little longer than my Chubby 2 synthetic to dry. I also notice the clumping when drying with the Big Bruce, and I don't have this clumping with the Chubby 2, but Simpson manage to pack an insane about of bristles in their knots compared to the BB. I put the clumping down to there been less bristles when compared to the Chubby 2. Although I don't hold my Chubby 2 like you mention very often. I have had no trouble holding it the way you mention on the few occasions I have, and I have smallish hands to. Thanks - now I want to get the Chubby! @Talster Love those pics in your first post. Those bowls look great. Do the ridges actually help with lathering or are they just cosmetic? Just asking because I’ve never made thick luxurious lather with cream like in those pics and I want to! I sometimes get clumping in my denser synthetic brushes if I haven't rinsed for long enough after use. They also seem to make a slightly different sound when stropping dry so it's back to the tap again for a better rinse to make sure all the soap residue is gone. Excellent review and observations on the Big Bruce. It has a wonderful grip. Incidentally I used it today morning and it holds lather very well for a three pass shave !